Good on You is an app-based program I somehow stumbled upon while we were traveling in Australia. The company is based in Australia, so many of the brands you will see evaluated here are Aussie, but don’t let that deter you because they have been rapidly expanding and include many brands outside of Australia. This app is incredibly helpful if you are out-and-about shopping and are considering a purchase. You can search for the brand name through the app and it will give you a rating of that company of: "Great", "Good", "It’s a start", "Not Good Enough", or the ominous, "We Avoid". Their ratings are based on how the brand perfoms related to it's treatment of people, the planet, and animals using information gleaned from over 50 different certification schemes. I found this incredibly helpful while out shopping in Barcelona. I desperately needed a new pair of sandals that I could wear while walking everywhere and stumbled upon a Camper store. I quickly looked the company up on Good On You and saw their rating of “We Avoid” and turned around and headed back out the door. This app is also useful if you know the category of item you need, like sandals, then you can search for companies who make that category of product and choose to shop from those with the best rating. If you search a brand and they haven’t given it a rating, then you can suggest they evaluate it. As a side note, I subscribe to very few newsletters because I hate clutter in my inbox, but theirs is one that I will actually open and read since it will usually help to give me an insight into ethical brands that are out there or guides to understanding organic cotton through their very informative blog "The Good Edit". To become a Certified B Corps, companies must complete an assessment that provides a rating based on how they perform in the following categories: Governance, Workers, Community, Environment. On the list of over 2,000 companies who are B Corp Certified, you will see Patagonia, Chico Bag Company, Keep Cup, Love Bottle and more. Not sure if a company you like is B Corp Certified? You can search the B Corp directory by company name, product, location, etc. With so little to guide you in choosing who you want to give your hard-earned dollar to, looking for this certification helps. You could even take this a step further and do your best to choose from companies who have the highest ratings. This can help push companies to do even more! No one wants to unknowingly support a company that runs a sweatshop with poor working conditions or who employ child labor. Nor do we we want to buy from a company that pollutes the environment. But how do you know if it does or not? You don’t. That’s the reality. Unless you’ve traveled to the factory where your favorite shoes were made and have seen the conditions for yourself, you have very little to go on in making that conclusion. So what can you do? Well, one way to lessen the risk that you are buying something made unethically, is to buy products that were made in the USA. While there are no guarantees, in the US we have labor laws and environmental standards that work to prevent abuses. Do abuses still happen? Yes, but it’s less likely than somewhere overseas. I haven't even mentioned the lower carbon footprint!!! Now, Fair Trade has come under a lot of criticism for not doing enough or for perpetuating a cycle of inequality in the regions where farmers have created co-ops and become Fair Trade Certified. Is it perfect? A complete panacea to the concerns around our global economy and the welfare of people all around the world? Certainly not, but it’s better than nothing. And like many of these certification schemes, the more we consumers raise our standards, so too will the producers follow. Poshmark, Mercari, Thred Up, and Swap are a few of the most popular online shops for used goods out there. I have the most experience using Poshmark for both buying and selling. It can sometimes be hard to get people to ship plastic-free, but overall my experiences have been super positive. There is also, of course, Craigslist, but you might also check out your neighborhood thrift store, Buffalo Exchange, Crossroads, or other consignment store. I’ve found it incredibly helpful to know exactly the item I’m looking for and then head straight to that online search or rack in the store to save time (I hate clothes shopping!). You may also find success turning around some previously loved items of your own too and keep them out of the landfill. I haven't tried these brands above but am intrigued! If you give any of them a try, let me know what you think! Certainly there are a million more questions you can ask, but I’ve found that asking maybe even one or two of these questions and seeing how they respond can give me enough guidance to know if it’s a company I feel comfortable giving my money to or not. And ask around, read reviews, etc. Taking just a little bit of time to do your due diligence is always a good idea if you can. Want to find some specific brands you can feel good about supporting? 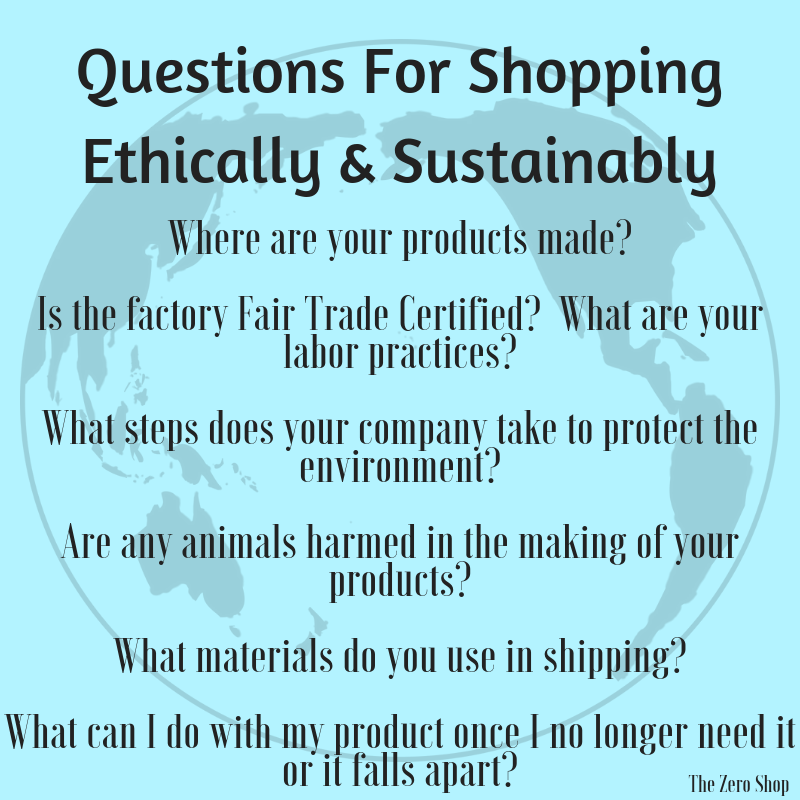 Check out this very thorough Ethical Shopping Guide from The Art of Simple. Got any other tips? I would love to hear them! *As usual, there are no affiliate links here. Just our opinions!